CTS Middle East, which specialises in products used for aboveground storage tanks, has been selected by Saudi Aramco as the supplier of choice for the design, manufacture and installation of gauge pole socks on Aramco storage tanks. CTS was chosen by Saudi Aramco after a careful review process, says a company spokesman. CTS’ gauge pole socks and sleeves are typically available for all gauge pole configurations and dimensions. A gauge pole sock seals in vapours that would otherwise leak from the inside of the tank through the slots in the pole and into the outside air, he says. The sock is clamped to the gauge poles, or to a transition box positioned on top of the floating roof. 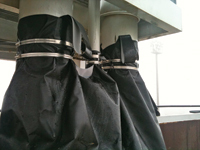 These results in a reasonably tight gauge pole enclosure that can deal with ultra-violet and ozone exposure, as well as exposure from hydrocarbons, he explains. Apart from reducing storage tank emissions by fitting adequate tank seals, there are several other sources of emissions from open-top storage tanks that require addressing. One of the largest sources of emissions that needs to be tackled is the gauge pole penetration as typical for open-top tanks, he says. 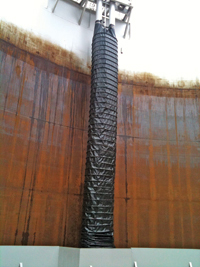 These emissions come from the (usually slotted) pipe as well as from the well, penetrating the floating roof. Another way of reducing gauge pole emissions is to fit a gauge pole sleeve, which is a metal sleeve fitted into the gauge pole well. It does not stop the wind from blowing through and around the gauge pole like the sock, but it does stop emissions from the well, which typically present the largest source of emissions for gauge poles. As it is usually made from stainless steel it represents a durable and low-cost emissions reduction measure, he adds.